Wow what a fantastic morning! 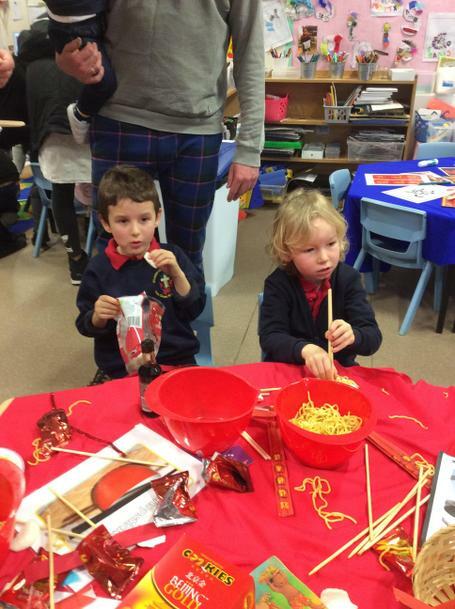 Today in Reception class, we celebrated the lunar new year. 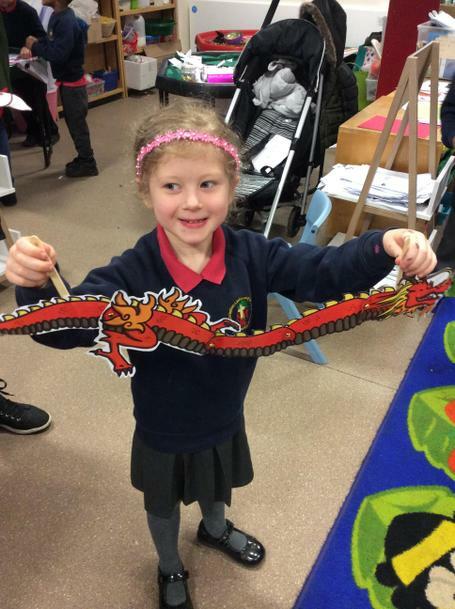 We learned a new song about a Chinese dragon, we heard the story of the Chinese New Year and we spoke Mandarin and Cantonese! 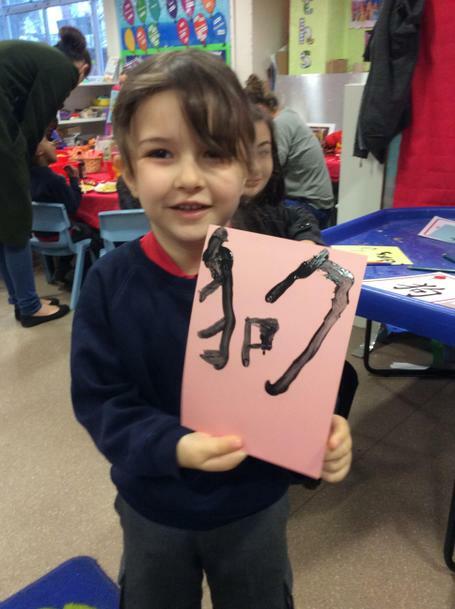 During our stay and play session, we made our own Chinese fire dragons. 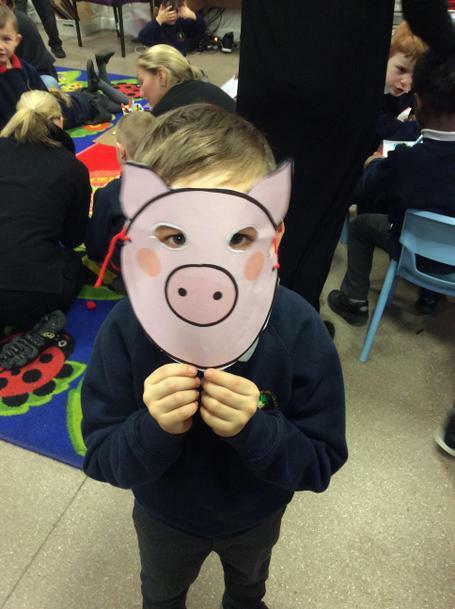 We made pig masks for the year of the pig. 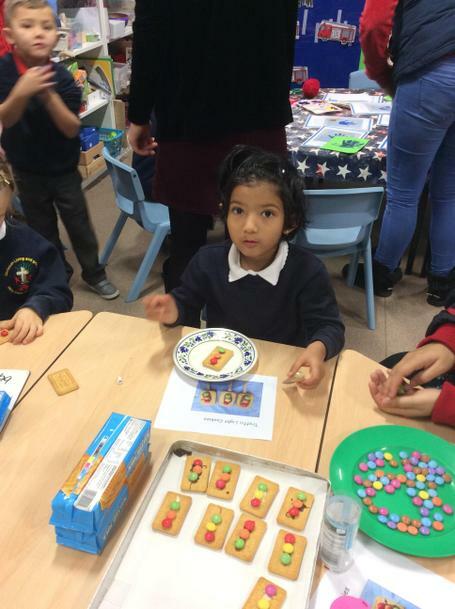 Our parents used the new year to poster to find out which year they were born in, Miss Stroud and Mr Smart were born in the year of the rat and Mrs Davies was the year of the snake. The children born in 2014 were the year of the snake and the children born in 2015 were born in the year of the horse. 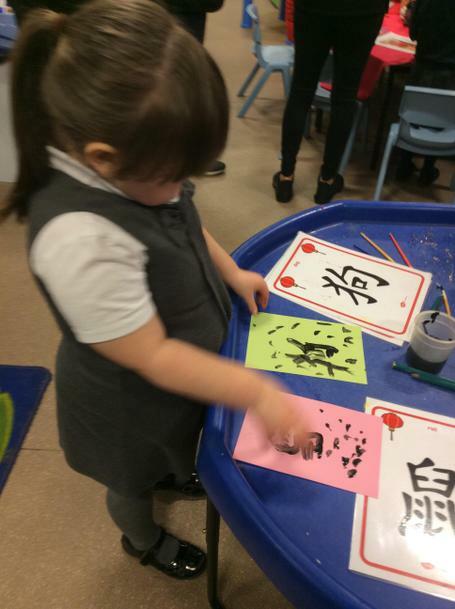 We painted Chinese words and numbers. 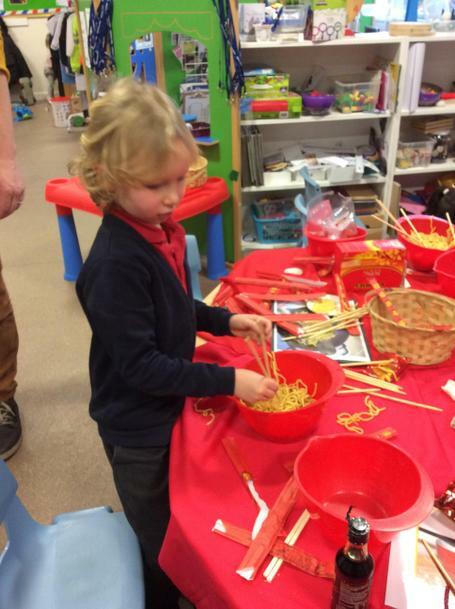 We learned to use chop sticks and tried some noodles, prawn crackers and fortune cookies. We read our fortune inside the cookie and danced with our dragons. 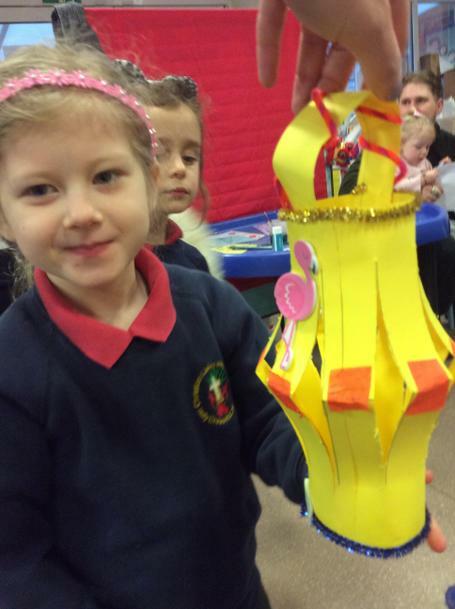 We made Chinese lanterns with our grown ups. We used our phonics to write the names of the animals. We read books about China and celebrations. We will receive our good luck wallets at the end of the day with our present inside and will all take home a 🥠 fortune cookie! We listened to Chinese music and watched a Chinese dragon dance, we made our own Chinese drums! Kung hei fat Choi everybody! Shin yuen quai luau! 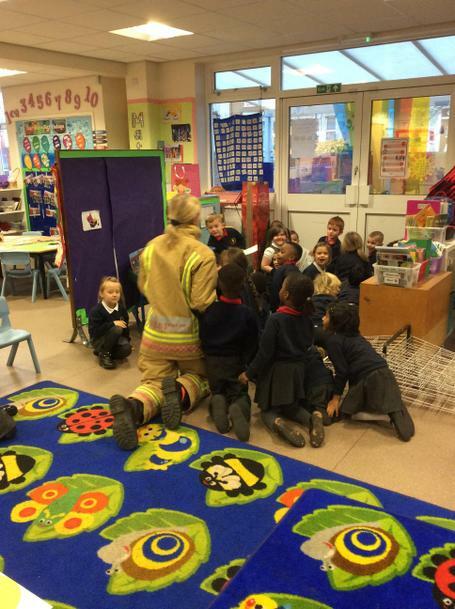 On Wednesday, we were so lucky, we had a visit from a real fire fighter. 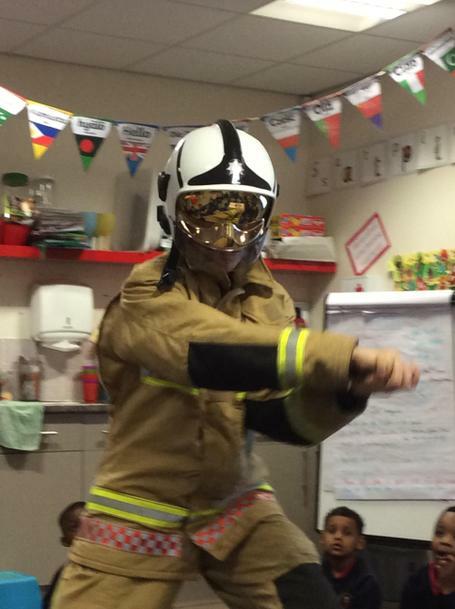 Linda showed us the types of clothes she wears to keep her safe when she puts out fires. 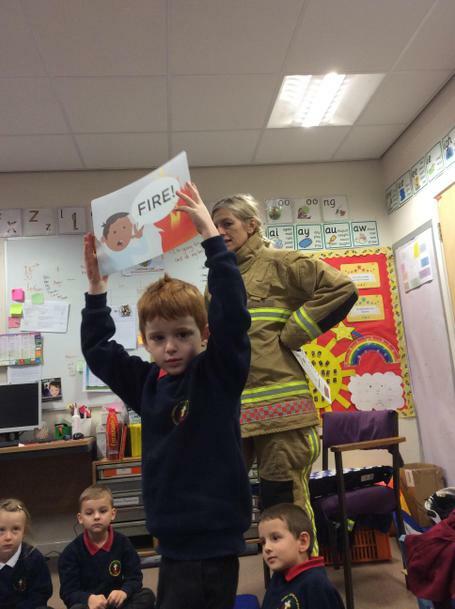 She brought in some interesting posters to show us what to do if there is a fire in our house. We should stay nice and low, shout fire, get out of the house and call 999! We asked her some questions that we had thought about beforehand. 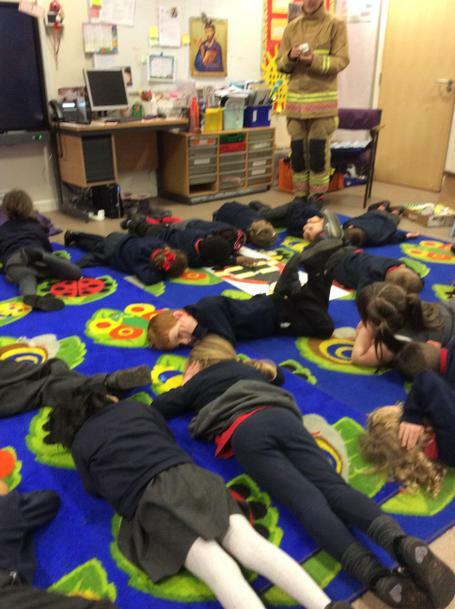 Linda was very helpful, we now know what to do if there is a fire! 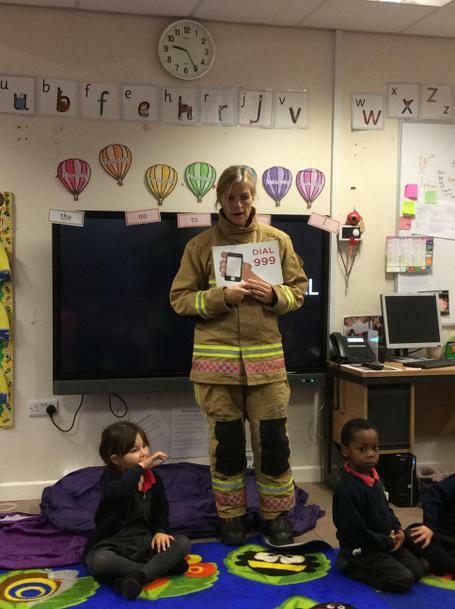 We were able to share lots of information with Linda because we have been learning about the fire service. 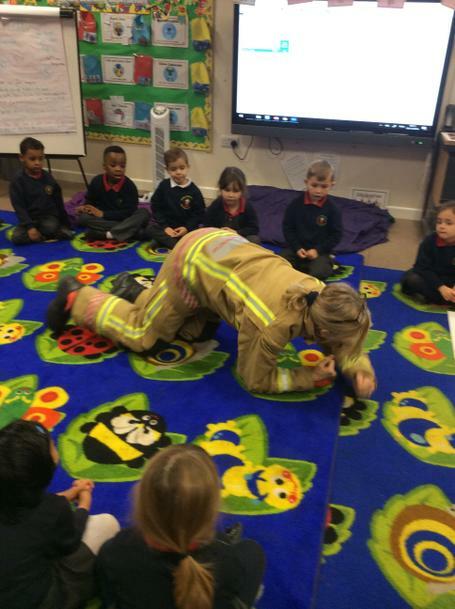 We sang a song about 5 little firefighters and acted it out. When she left, she gave us some uniforms and helmets to use to dress up in. This morning, we had such a fantastic start to our day! 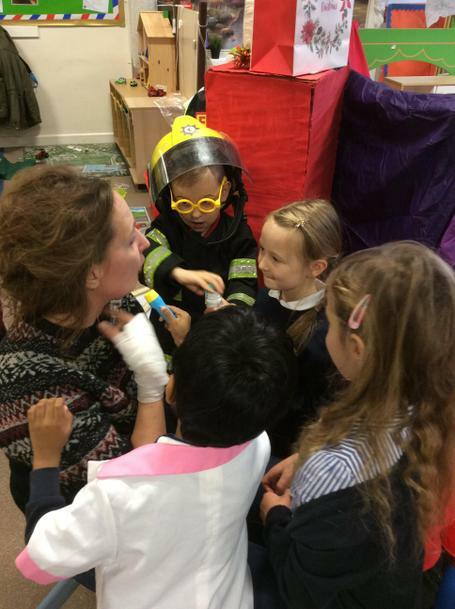 We invited all our grown ups in to join in our learning journey about people who help us. 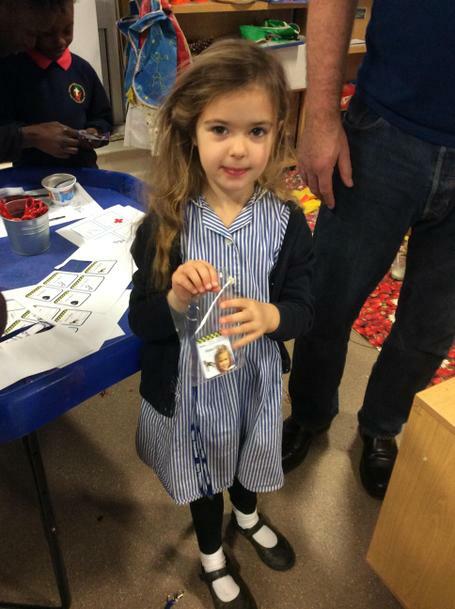 We made ID badges, matching our faces and writing our names. We read sentences about different jobs and matched them to the pictures. 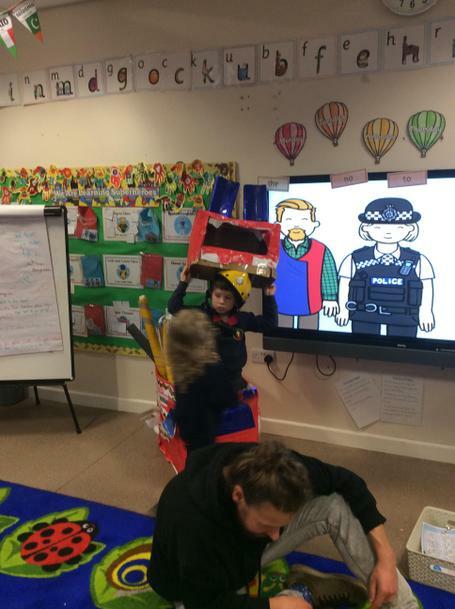 We acted out crossing the road safely, remembering to stop, look, listen and think. We made traffic light cookies, matching the colours and talking about shape, we thought about balanced meals and sugar and how after eating them we should brush our teeth. We used our fine motor skills to squeeze the icing out and press the smarties in. 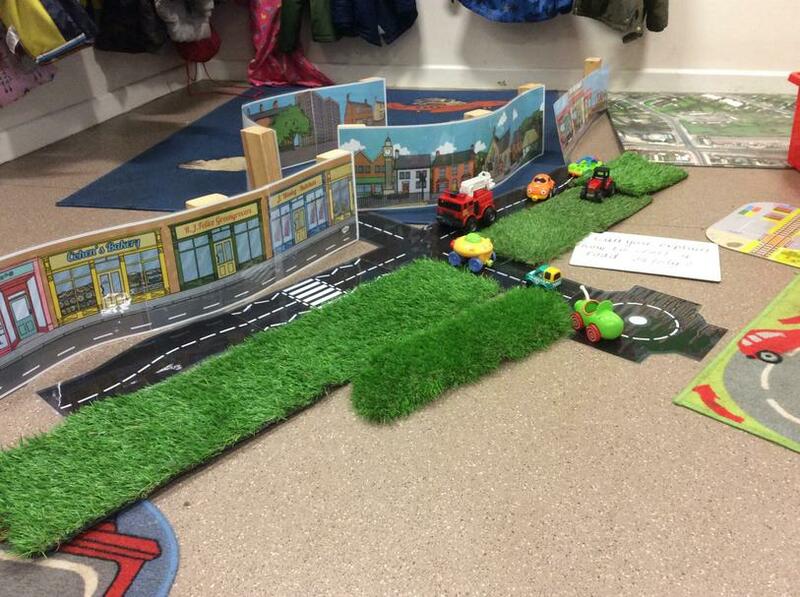 We made links to our learning by telling our grown up what we know about traffic lights and how they keep us safe. 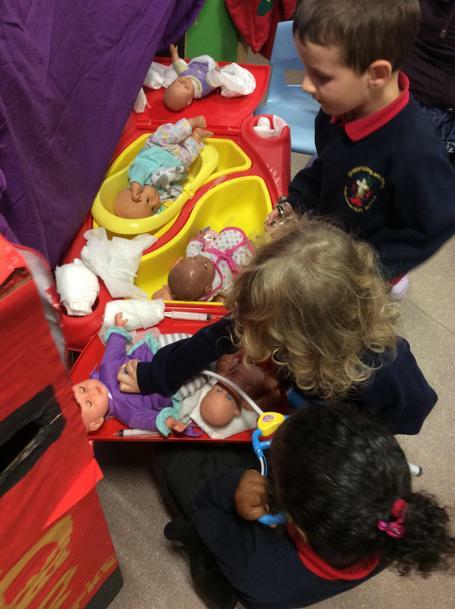 We dressed up as nurses and doctors and used bandages and injections to look after our poorly babies. We matched number to quantity on our fire fighter wall. 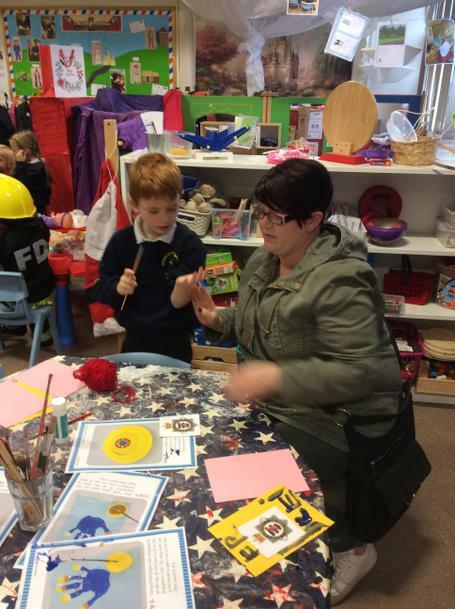 We made police and fire hats, we painted fires and fire fighters. 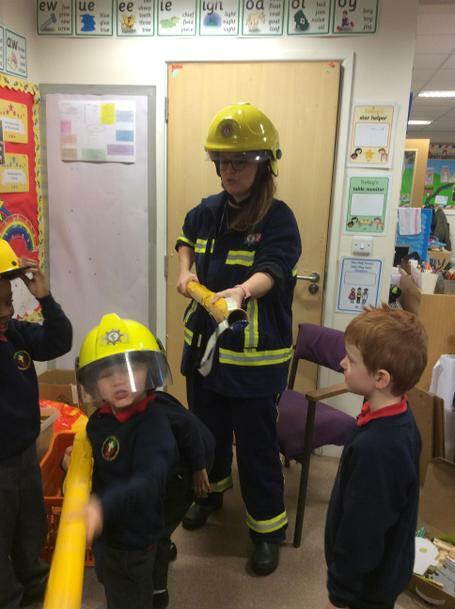 We sang songs about fire and played in our fire engine. 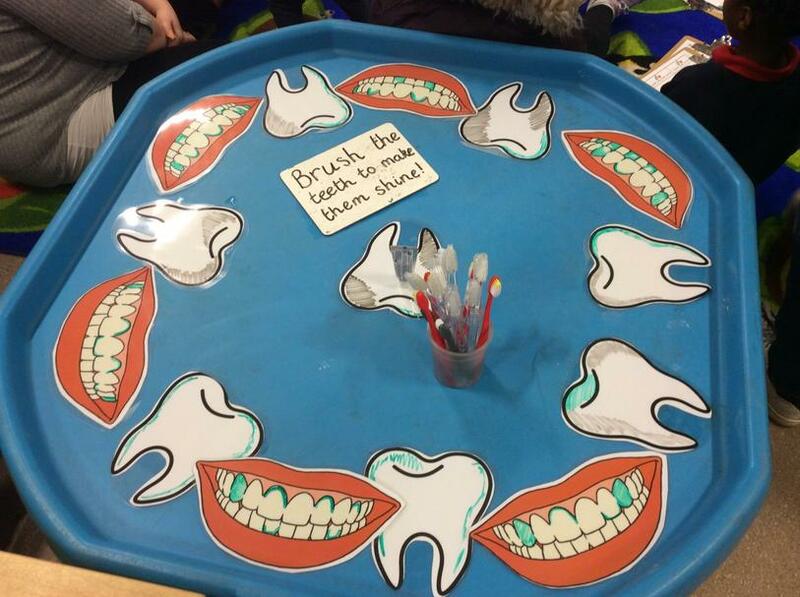 We thought about dentists and brushing our teeth. 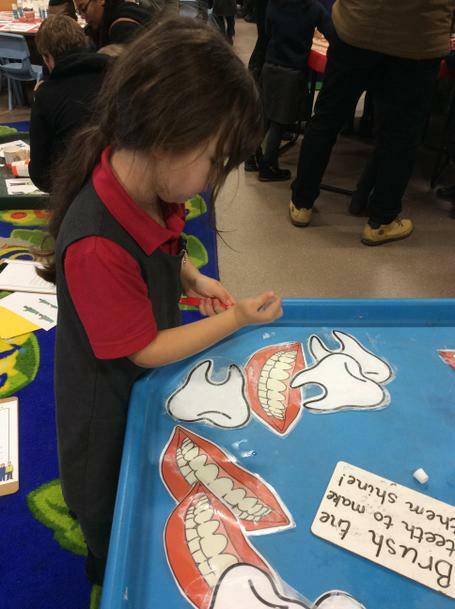 We used toothpaste to remove the germs from the big teeth. 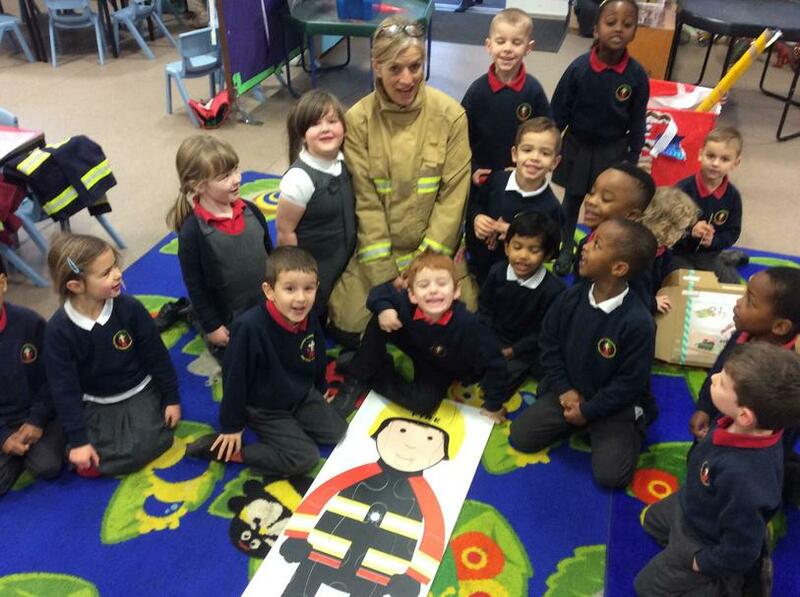 We thought about what we would like to be when we grow up and matched our face to the jobs. What a busy day but it was so much fun! 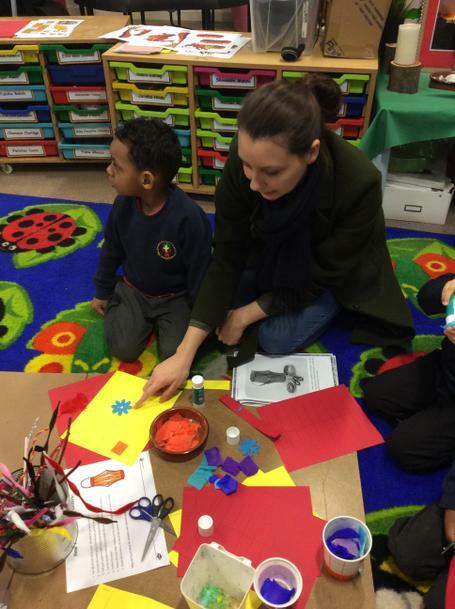 Thank you again to all the parents who came to join us in our learning journey today. People who help us, safety day! Wow, what an amazing surprise we have had this morning, in the post Reception class received a very special letter from Her Majesty Queen Elizabeth II. She thanked all the children in Reception class and said it was very thoughtful for them to write to the Queen regarding all the plastic in the sea and how bad it is for the animals and the environment. It is so fantastic that the Queen has taken time out to write to us all to say thank you. Reception class were very passionate about how dangerous it is for all the animals that we keep using all this plastic and putting it in the sea and damaging their environment. What amazing news, it is so exciting that you are all making an impact. Welcome to Reception at Holy Cross Primary! We hope that you are all settling in well to the new school and that the children are telling you all about their adventures! I have included just a few things below about the start of term. In the morning the teachers will greet you outside of the classroom door where the children should be dropped off between 8:45am and 8.55am. In order to start the day promptly please could you ensure that you arrive in plenty of time. At the end of the day the gates open at 3.10pm. Please continue to collect your child from the classroom door. Your child will be offered fruit and milk in the morning and again in the afternoon every day for their snack. School meals will also be provided this year but the children will need to make a choice each morning between hot, cold or vegetarian meals, it would be helpful if you could go through the menu with your child each night so they are prepared to make their choice each morning. We have a small supply of spare clothes in case of emergency. If your child comes home wearing spare clothes belonging to school please wash and return them as soon as possible. It’s always a good idea to keep a spare pair of pants, trousers or a skirt and a spare t-shirt in your child’s school bag. 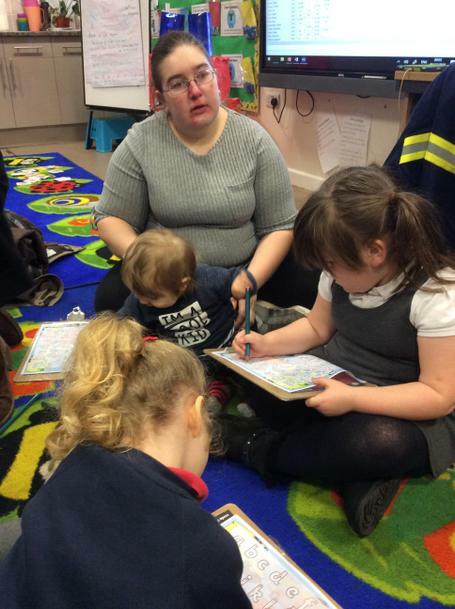 Every Thursday afternoon, the children will attend Forest School with Mrs Krysiek. 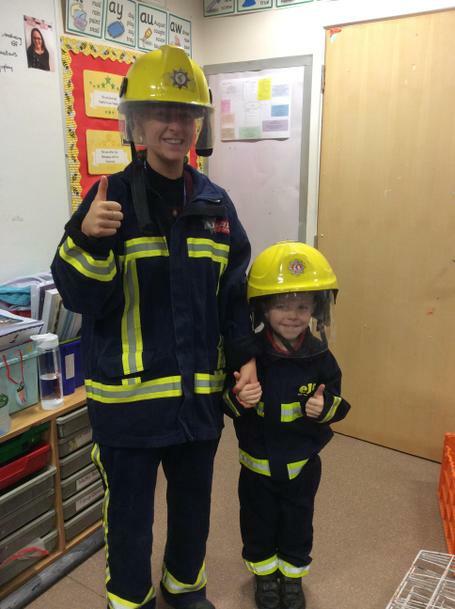 It would be helpful if you could send the children in a pair of wellies and, if they have them, waterproof trousers however, we do have a small supply of wellies and waterproof trousers so it’s not a necessity. The Reception children will have PE on Thursdays. PE kits will remain in the classroom until half term, when we will send them home to be washed. Please make sure that all items of clothing are labelled including socks and shoes. 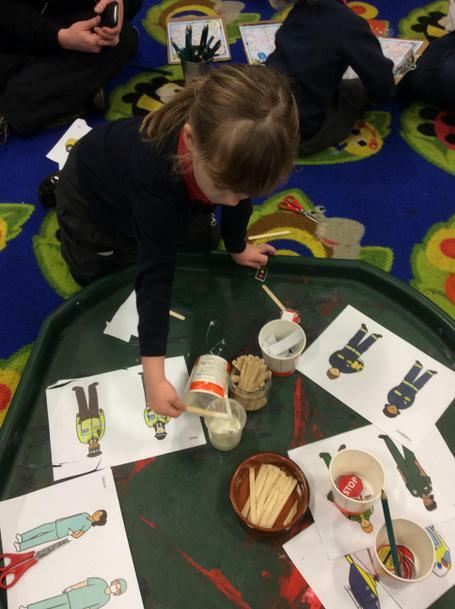 The children will change in and out of their PE kits each time they have PE. So please help your child to practise changing their clothes independently. For now, we are incorporating P.E. into their outdoor learning time, so I will let you know when we begin the structured PE lessons. I.C.T. is also incorporated into the daily routine of the class; the children can chose to use the listening station, the SMART board and the I-Pads throughout the school day, to record their learning. In Reception class, we follow a positive behaviour policy whereby children are encouraged to treat others as they would like to be treated. We have rewards for positive behaviour and sanctions for negative behaviours whereby we use the sunshine and cloud system. 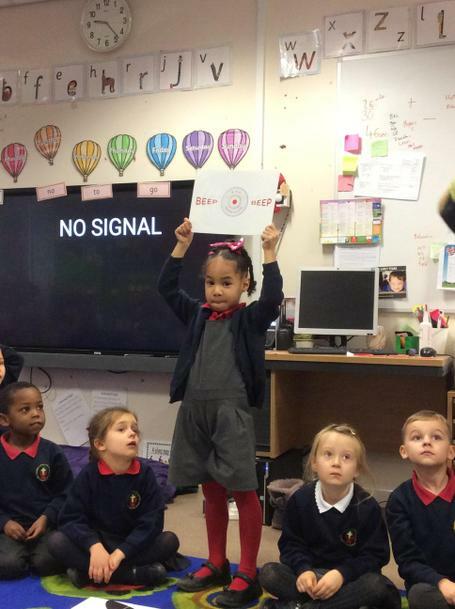 All children start their day on ‘the sun’, if they follow our golden class rules, they can move up to ‘the rainbow’. If they don’t follow the golden rules, they can move to the ‘sad cloud’. They have the opportunity to move off the sad cloud and back up to the sun each time. During the first half of term, we will focus on supporting the children to settle into daily life at school and ensuring that they have a happy and enjoyable start to their time at Holy Cross. We will begin teaching the children to read through daily phonics lessons. 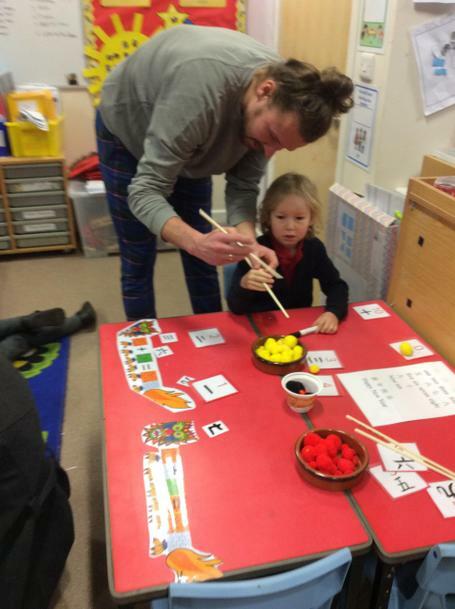 The children will learn four ‘sounds’ each week which they will be asked to practise at home with the support of an adult. 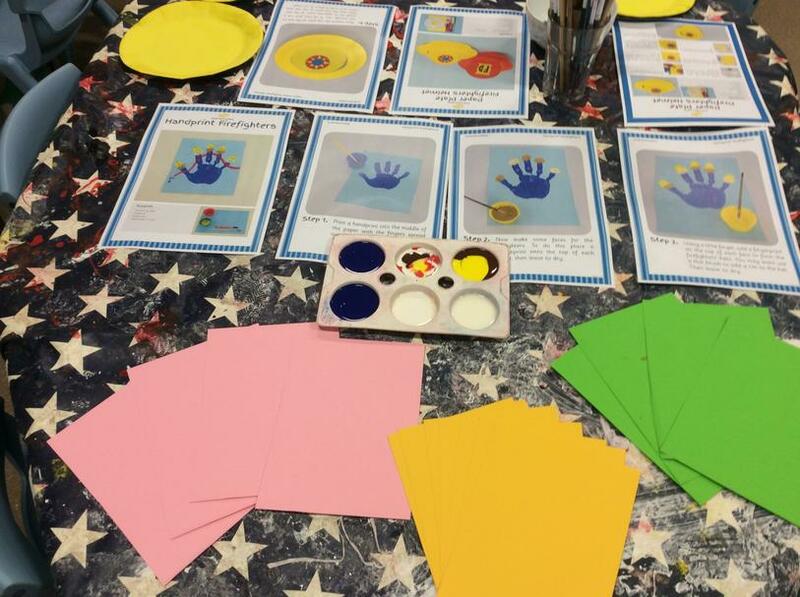 When they are ready, the children will be given a simple book to read which they will take home, it will link into their phonics sounds, so they should be able to begin to ‘de-code’ these books soon. The morning and afternoon sessions will be a mixture of play-based learning, independent learning time and adult led time. 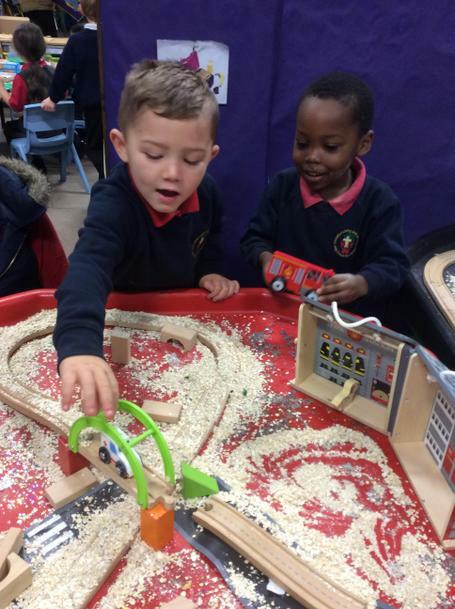 During play based time, the children will be given the opportunity to extend their learning through independent and collaborative tasks and activities both inside the classroom and in the outdoor area. Please do not hesitate to contact us if you have any questions. Miss Stroud will be available at the beginning and end of each day for any quick queries that you may have. You can also book an appointment if you would like to discuss anything in length. 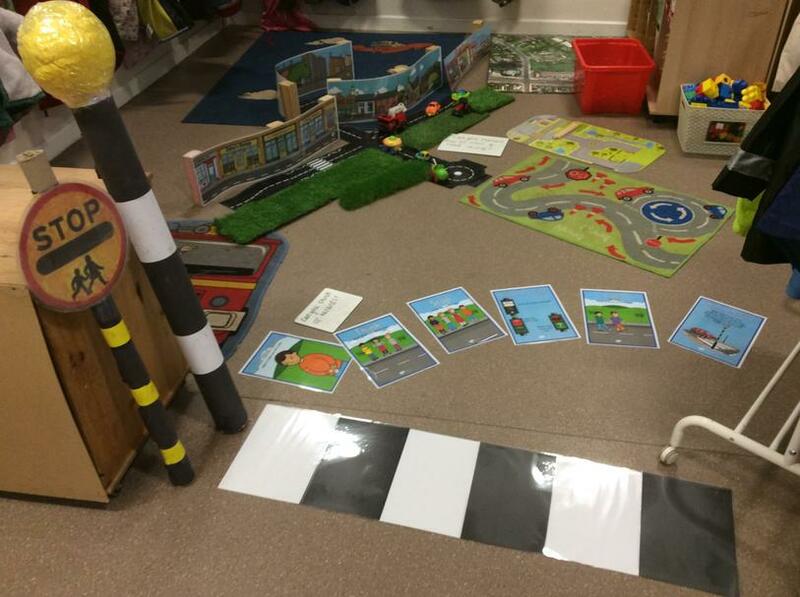 All children in Reception have a personal on-line Learning Journey, whereby we record photos, observations and comments. This is very exciting - we will let you know more about Tapestry in the Reception meeting. 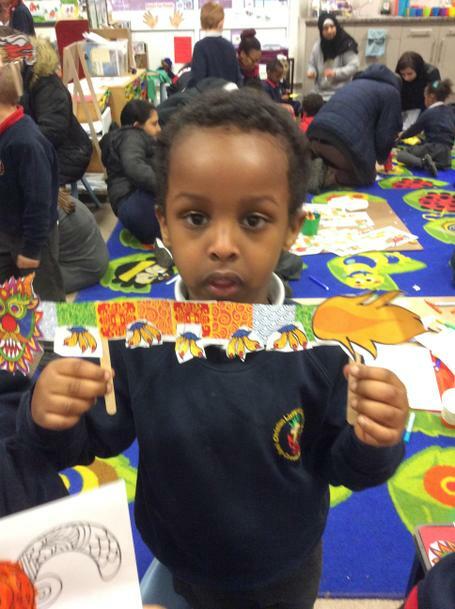 We look forward to working with you and getting to know your child over the coming term. I have included a photo I found online that you might like and I apologise in advance for all the uniform washing!